“I am going to attempt — and fail — to adequately describe the merits of the astonishing “Anomaly.” This collaboration between local performance troupe BIODANCE, local musical group Sound ExChange, and RIT professor and multimedia artist W. Michelle Harris was the most amazing piece I’ve seen thus far at Fringe 2013. It was so lovely to behold that I found myself dreading its inevitable conclusion. 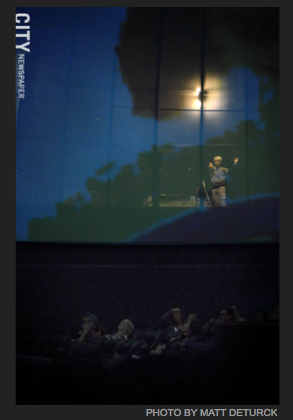 The performance is staged at the Rochester Museum & Science Center’s Strasenburgh Planetarium, and the venue itself is a critical component of the work. The show actually began in the lobby, as a small grouping of futuristically dressed dancers performed strong, aggressive, yet elegant movements choreographed by Eran Hanlon. 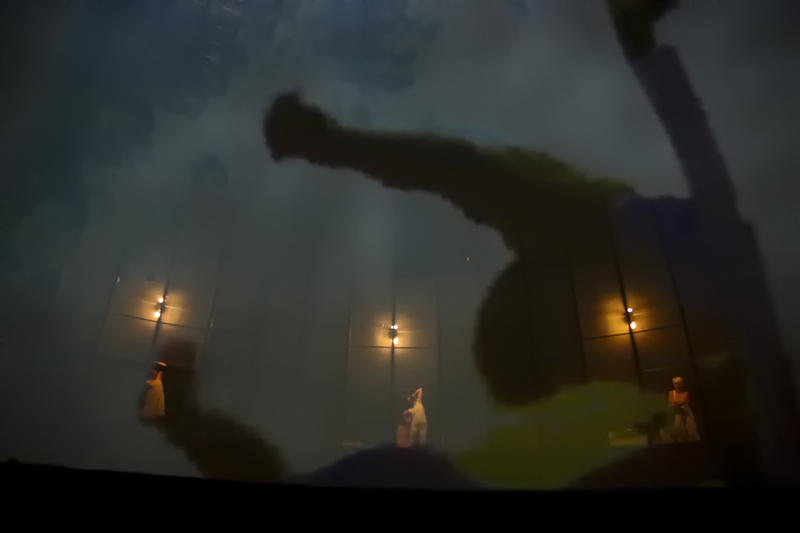 It then moved into the Planetarium’s dome theater for the bulk of the show, featuring a larger troupe dancing choreography by BIODANCE Artistic Director Missy Pfohl Smith. 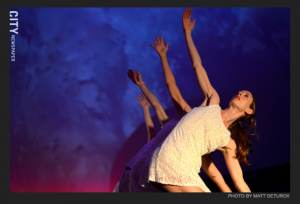 “Anomaly,” to me, was a brilliant merging of modern dance, classical music, and eye-popping visuals. Every element of this show reflected a great deal of thought and artistry. I’m hesitant to make assumptions about the intent behind modern dance, but in the five almost seamless pieces I picked up recurring themes about reaching for the heavens, flight, migration, community, and the cosmos — all of which made perfect sense given the surroundings. I found myself reflecting on the concept that life on this planet, in a cosmic sense, is itself an anomaly. A beautiful, terrifying, delicate anomaly. The dancing was consistently graceful and inventive. I was repeatedly surprised, delighted, and inspired. The music by Sound ExChange — the live string quartet performed works by John Cage and Arvo Part — was the perfect accompaniment to the slow, sweeping movements. Finally, the projections by Harris were almost impossibly cool, varying from fascinating bisecting color grids to kaleidoscopic backdrops that, when combined with a handful of helium balloons and their shadows, made for a hypnotic and enveloping visual element. “Anomaly” is a true sensorial experience. If anything, the challenge comes in taking all of the performance aspects at once, especially the dancing given the unique layout of the Planetarium. But for 60 minutes I found myself enraptured in a brilliantly crafted world of beauty, melody, and calmness. Exceptional work by everyone involved in this very special show. Premiere – September 21, 22, 27 and 28, 2013 at Rochester Museum and Science Center’s Strasenburgh Planetarium. Repeated and reworked in 2016.